Welcome to the Stanbridge Drum Company and thank you for visiting our website. I’m Pete Stanbridge, owner and sole craftsman of this small family-owned business located in Newfoundland, Canada, near the Easternmost point in North America. 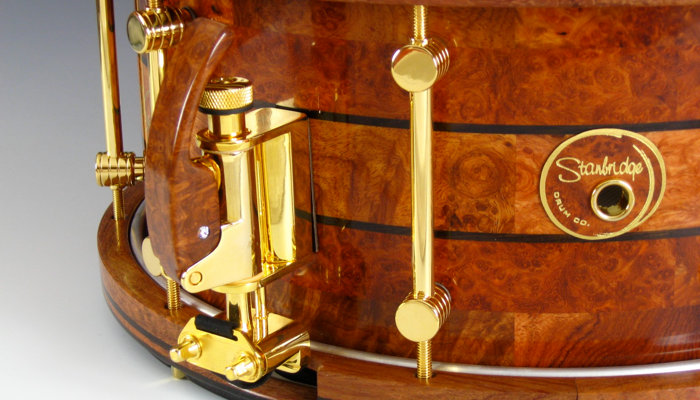 The company’s focus is on handcrafting the finest wood snare drums and drum kits available anywhere. I devote a great deal of time and attention on the details required to make that happen. I hope you enjoy your visit to our website. September 1st, 2011 marks an important day in the company’s history. In partnership with Styx drummer Todd Sucherman, Stanbridge Drums is pleased to announce the launch of the Empyrean; the Todd Sucherman signature limited edition snare drum. We have created a complete website to introduce the many incredible and unique features of this percussion offering, and we would encourage you to take a look at www.empyreandrum.com . Please come back and visit us here too! As always, we would love to hear what you think about our instruments, so please feel free to drop us a line when you are through browsing.